Custom event maps and wedding maps help your special day flow smoothly, by showing guests where your function will take place. 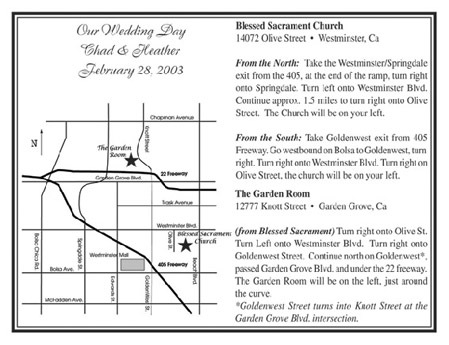 The map, including instructions for approaches from all directions, can be included with each invitation. Printed cards are available, see additional printing fees below. $50 non-refundable deposit required to begin the design process. Maps can be sent to you in a digital format of your choice (PDF, JPG, etc) ready for printing for $15 or let us print your cards for you, see additional printing fees below. Map size may vary depending on the distance of the locations and the quantity of information and directions you want included. We prefer that you give us the dimensions of your invitation envelope so that we can custom fit your map. 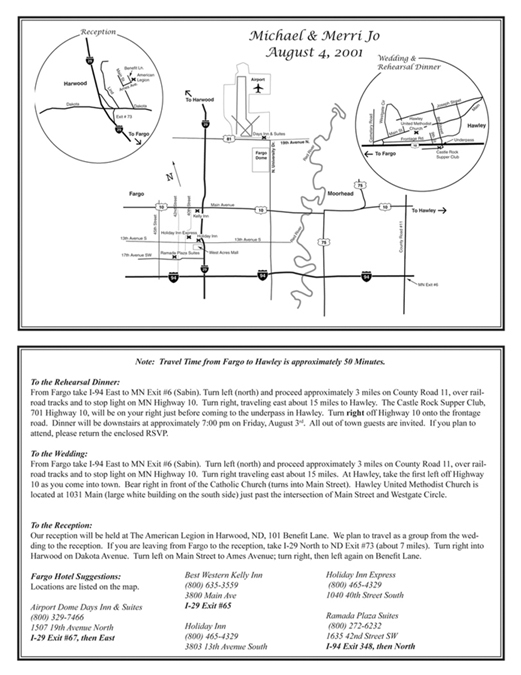 Maps can be sent to you in a digital format of your choice (PDF, JPG, etc) ready for printing for $15. We offer printing services on a variety of papers to match any wedding ensemble. All maps come finished and cut to size. 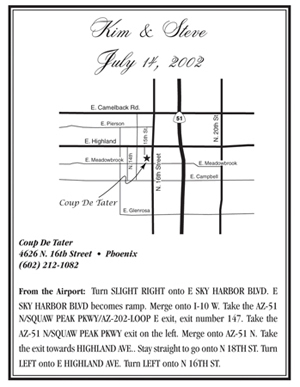 Double sided printing is also available for adding written directions or hotel information on the reverse. All above prices are quoted in black ink. Full color ink can be substituted for an additional cost of $0.60 per sheet. Special papers are available, please contact us for availability and styles. Cardstock is available in the colors listed above.